Instances of class types can also implement a deinitializer, which performs any custom cleanup just before an instance of that class is deallocated. For more information about deinitializers, see Deinitialization. You can set an initial value for a stored property within an initializer, or by assigning a default property value as part of the property’s definition. These actions are described in the following sections. When you assign a default value to a stored property, or set its initial value within an initializer, the value of that property is set directly, without calling any property observers. // Prints "The default temperature is 32.0° Fahrenheit"
As with function and method parameters, initialization parameters can have both a parameter name for use within the initializer’s body and an argument label for use when calling the initializer. However, initializers do not have an identifying function name before their parentheses in the way that functions and methods do. Therefore, the names and types of an initializer’s parameters play a particularly important role in identifying which initializer should be called. Because of this, Swift provides an automatic argument label for every parameter in an initializer if you don’t provide one. If you do not want to use an argument label for an initializer parameter, write an underscore (_) instead of an explicit argument label for that parameter to override the default behavior. // Prints "Do you like cheese?" You can assign a value to a constant property at any point during initialization, as long as it is set to a definite value by the time initialization finishes. Once a constant property is assigned a value, it can’t be further modified. For class instances, a constant property can be modified during initialization only by the class that introduces it. It cannot be modified by a subclass. // Prints "How about beets?" Structure types automatically receive a memberwise initializer if they do not define any of their own custom initializers. Unlike a default initializer, the structure receives a memberwise initializer even if it has stored properties that do not have default values. The memberwise initializer is a shorthand way to initialize the member properties of new structure instances. Initial values for the properties of the new instance can be passed to the memberwise initializer by name. The example below defines a structure called Size with two properties called width and height. Both properties are inferred to be of type Double by assigning a default value of 0.0. The rules for how initializer delegation works, and for what forms of delegation are allowed, are different for value types and class types. Value types (structures and enumerations) do not support inheritance, and so their initializer delegation process is relatively simple, because they can only delegate to another initializer that they provide themselves. 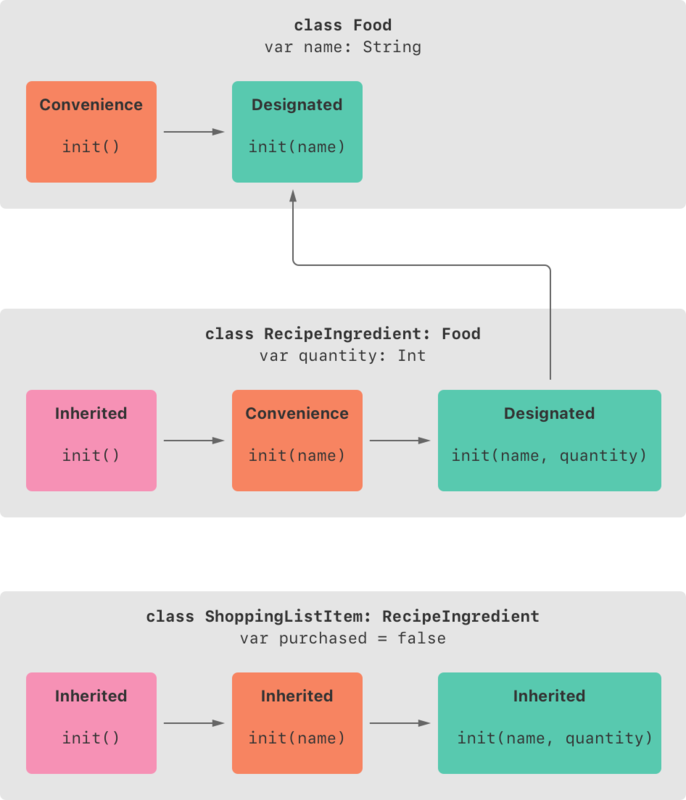 Classes, however, can inherit from other classes, as described in Inheritance. This means that classes have additional responsibilities for ensuring that all stored properties they inherit are assigned a suitable value during initialization. These responsibilities are described in Class Inheritance and Initialization below. For value types, you use self.init to refer to other initializers from the same value type when writing your own custom initializers. You can call self.init only from within an initializer. Note that if you define a custom initializer for a value type, you will no longer have access to the default initializer (or the memberwise initializer, if it is a structure) for that type. This constraint prevents a situation in which additional essential setup provided in a more complex initializer is accidentally circumvented by someone using one of the automatic initializers. If you want your custom value type to be initializable with the default initializer and memberwise initializer, and also with your own custom initializers, write your custom initializers in an extension rather than as part of the value type’s original implementation. For more information, see Extensions. For an alternative way to write this example without defining the init() and init(origin:size:) initializers yourself, see Extensions. Every class must have at least one designated initializer. In some cases, this requirement is satisfied by inheriting one or more designated initializers from a superclass, as described in Automatic Initializer Inheritance below. You do not have to provide convenience initializers if your class does not require them. Create convenience initializers whenever a shortcut to a common initialization pattern will save time or make initialization of the class clearer in intent. Here, the superclass has a single designated initializer and two convenience initializers. One convenience initializer calls another convenience initializer, which in turn calls the single designated initializer. This satisfies rules 2 and 3 from above. The superclass does not itself have a further superclass, and so rule 1 does not apply. The subclass in this figure has two designated initializers and one convenience initializer. The convenience initializer must call one of the two designated initializers, because it can only call another initializer from the same class. This satisfies rules 2 and 3 from above. Both designated initializers must call the single designated initializer from the superclass, to satisfy rule 1 from above. Swift’s two-phase initialization process is similar to initialization in Objective-C. The main difference is that during phase 1, Objective-C assigns zero or null values (such as 0 or nil) to every property. Swift’s initialization flow is more flexible in that it lets you set custom initial values, and can cope with types for which 0 or nil is not a valid default value. The class instance is not fully valid until the first phase ends. Properties can only be accessed, and methods can only be called, once the class instance is known to be valid at the end of the first phase. Working back down from the top of the chain, each designated initializer in the chain has the option to customize the instance further. Initializers are now able to access self and can modify its properties, call its instance methods, and so on. Finally, any convenience initializers in the chain have the option to customize the instance and to work with self. In this example, initialization begins with a call to a convenience initializer on the subclass. This convenience initializer cannot yet modify any properties. It delegates across to a designated initializer from the same class. The designated initializer makes sure that all of the subclass’s properties have a value, as per safety check 1. It then calls a designated initializer on its superclass to continue the initialization up the chain. The superclass’s designated initializer makes sure that all of the superclass properties have a value. There are no further superclasses to initialize, and so no further delegation is needed. As soon as all properties of the superclass have an initial value, its memory is considered fully initialized, and phase 1 is complete. 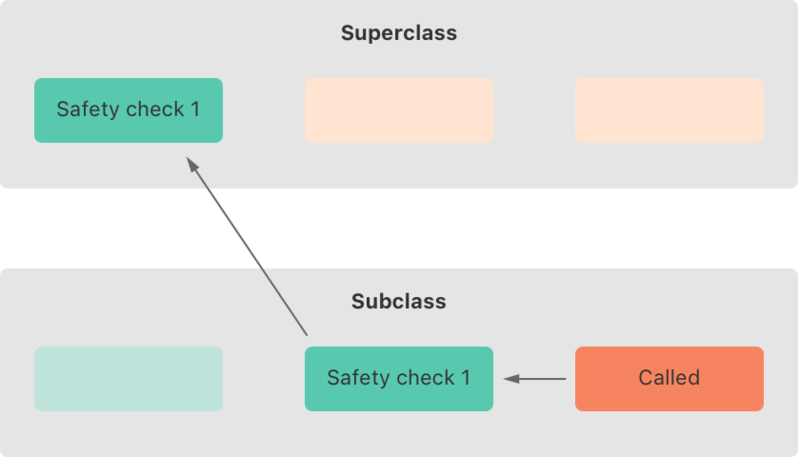 Superclass initializers are inherited in certain circumstances, but only when it is safe and appropriate to do so. For more information, see Automatic Initializer Inheritance below. If you want a custom subclass to present one or more of the same initializers as its superclass, you can provide a custom implementation of those initializers within the subclass. 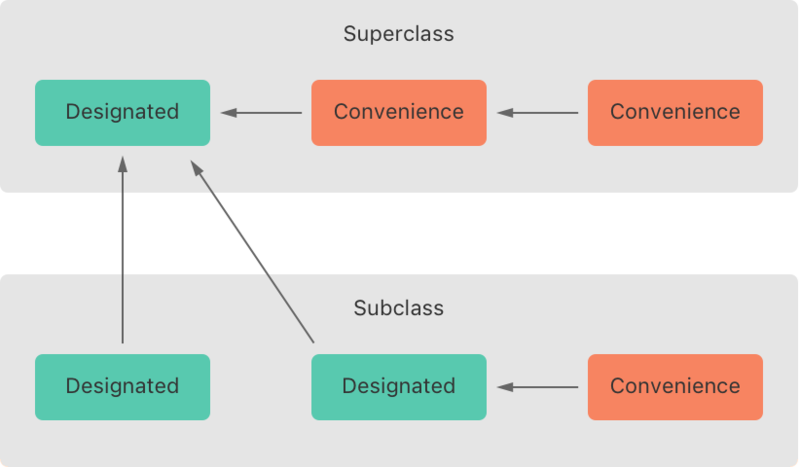 When you write a subclass initializer that matches a superclass designated initializer, you are effectively providing an override of that designated initializer. Therefore, you must write the override modifier before the subclass’s initializer definition. This is true even if you are overriding an automatically provided default initializer, as described in Default Initializers. As with an overridden property, method or subscript, the presence of the override modifier prompts Swift to check that the superclass has a matching designated initializer to be overridden, and validates that the parameters for your overriding initializer have been specified as intended. You always write the override modifier when overriding a superclass designated initializer, even if your subclass’s implementation of the initializer is a convenience initializer. The Bicycle subclass defines a custom designated initializer, init(). This designated initializer matches a designated initializer from the superclass of Bicycle, and so the Bicycle version of this initializer is marked with the override modifier. The init() initializer for Bicycle starts by calling super.init(), which calls the default initializer for the Bicycle class’s superclass, Vehicle. This ensures that the numberOfWheels inherited property is initialized by Vehicle before Bicycle has the opportunity to modify the property. After calling super.init(), the original value of numberOfWheels is replaced with a new value of 2. If a subclass initializer performs no customization in phase 2 of the initialization process, and the superclass has a zero-argument designated initializer, you can omit a call to super.init() after assigning values to all of the subclass’s stored properties. This example defines another subclass of Vehicle, called Hoverboard. In its initializer, the Hoverboard class sets only its color property. Instead of making an explicit call to super.init(), this initializer relies on an implicit call to its superclass’s initializer to complete the process. return "\(super.description) in a beautiful \(color)"
An instance of Hoverboard uses the default number of wheels supplied by the Vehicle initializer. These rules apply even if your subclass adds further convenience initializers. A subclass can implement a superclass designated initializer as a subclass convenience initializer as part of satisfying rule 2. // namedMeat's name is "Bacon"
The init(name: String) initializer from the Food class is provided as a designated initializer, because it ensures that all stored properties of a new Food instance are fully initialized. 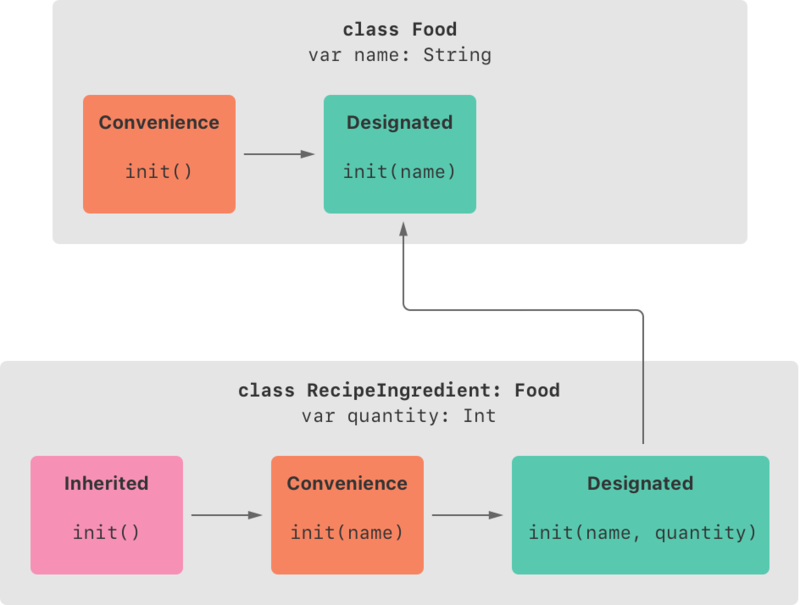 The Food class does not have a superclass, and so the init(name: String) initializer does not need to call super.init() to complete its initialization. // mysteryMeat's name is "[Unnamed]"
RecipeIngredient also defines a convenience initializer, init(name: String), which is used to create a RecipeIngredient instance by name alone. This convenience initializer assumes a quantity of 1 for any RecipeIngredient instance that is created without an explicit quantity. 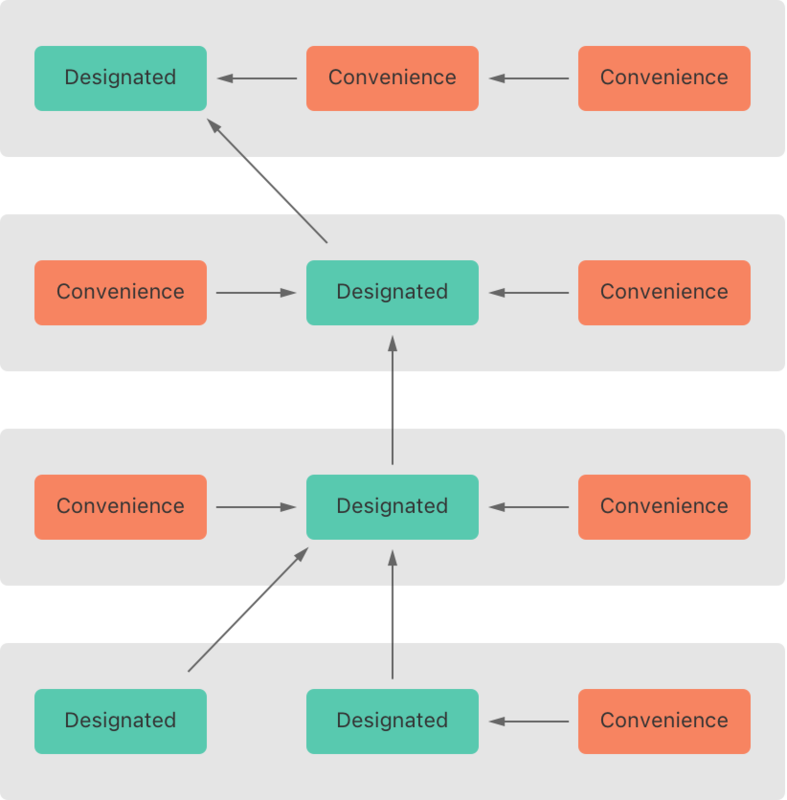 The definition of this convenience initializer makes RecipeIngredient instances quicker and more convenient to create, and avoids code duplication when creating several single-quantity RecipeIngredient instances. This convenience initializer simply delegates across to the class’s designated initializer, passing in a quantity value of 1. The init(name: String) convenience initializer provided by RecipeIngredient takes the same parameters as the init(name: String) designated initializer from Food. Because this convenience initializer overrides a designated initializer from its superclass, it must be marked with the override modifier (as described in Initializer Inheritance and Overriding). var output = "\(quantity) x \(name)"
Here, a new array called breakfastList is created from an array literal containing three new ShoppingListItem instances. The type of the array is inferred to be [ShoppingListItem]. After the array is created, the name of the ShoppingListItem at the start of the array is changed from "[Unnamed]" to "Orange juice" and it is marked as having been purchased. Printing the description of each item in the array shows that their default states have been set as expected. To cope with initialization conditions that can fail, define one or more failable initializers as part of a class, structure, or enumeration definition. You write a failable initializer by placing a question mark after the init keyword (init?). You cannot define a failable and a nonfailable initializer with the same parameter types and names. Strictly speaking, initializers do not return a value. Rather, their role is to ensure that self is fully and correctly initialized by the time that initialization ends. Although you write return nil to trigger an initialization failure, you do not use the return keyword to indicate initialization success. // Prints "12345.0 conversion to Int maintains value of 12345"
// Prints "3.14159 conversion to Int does not maintain value"
Checking for an empty string value (such as "" rather than "Giraffe") is not the same as checking for nil to indicate the absence of an optional String value. In the example above, an empty string ("") is a valid, non-optional String. However, it is not appropriate for an animal to have an empty string as the value of its species property. To model this restriction, the failable initializer triggers an initialization failure if an empty string is found. A failable initializer of a class, structure, or enumeration can delegate across to another failable initializer from the same class, structure, or enumeration. Similarly, a subclass failable initializer can delegate up to a superclass failable initializer. In either case, if you delegate to another initializer that causes initialization to fail, the entire initialization process fails immediately, and no further initialization code is executed. A failable initializer can also delegate to a nonfailable initializer. Use this approach if you need to add a potential failure state to an existing initialization process that does not otherwise fail. Note that if you override a failable superclass initializer with a nonfailable subclass initializer, the only way to delegate up to the superclass initializer is to force-unwrap the result of the failable superclass initializer. You can override a failable initializer with a nonfailable initializer but not the other way around. You can use forced unwrapping in an initializer to call a failable initializer from the superclass as part of the implementation of a subclass’s nonfailable initializer. For example, the UntitledDocument subclass below is always named "[Untitled]", and it uses the failable init(name:) initializer from its superclass during initialization. You typically define a failable initializer that creates an optional instance of the appropriate type by placing a question mark after the init keyword (init?). Alternatively, you can define a failable initializer that creates an implicitly unwrapped optional instance of the appropriate type. Do this by placing an exclamation mark after the init keyword (init!) instead of a question mark. You can delegate from init? to init! and vice versa, and you can override init? with init! and vice versa. You can also delegate from init to init!, although doing so will trigger an assertion if the init! initializer causes initialization to fail. You do not have to provide an explicit implementation of a required initializer if you can satisfy the requirement with an inherited initializer. Note that the closure’s end curly brace is followed by an empty pair of parentheses. This tells Swift to execute the closure immediately. If you omit these parentheses, you are trying to assign the closure itself to the property, and not the return value of the closure. If you use a closure to initialize a property, remember that the rest of the instance has not yet been initialized at the point that the closure is executed. This means that you cannot access any other property values from within your closure, even if those properties have default values. You also cannot use the implicit self property, or call any of the instance’s methods.